The 2016 OCR World Championships is here. 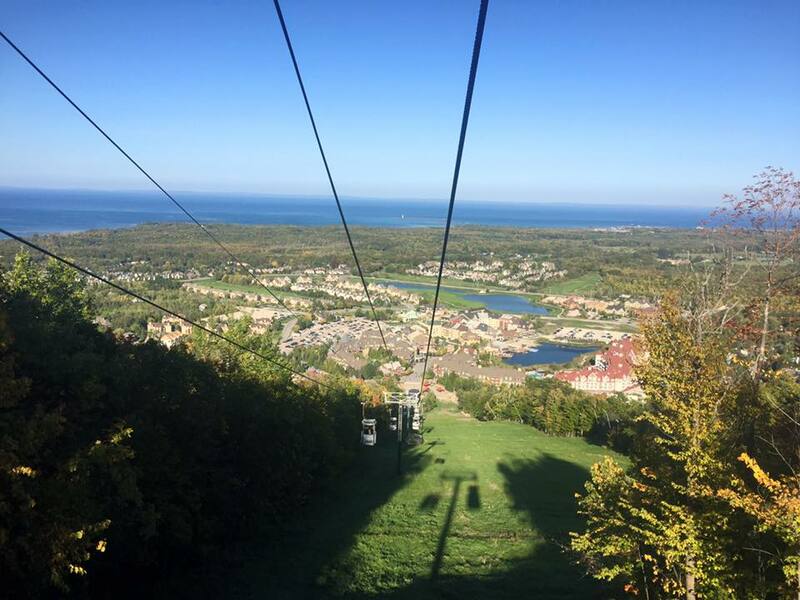 Athletes from around the world are starting to converge on Blue Mountain outside of Collingwood, Ontario from over forty countries. 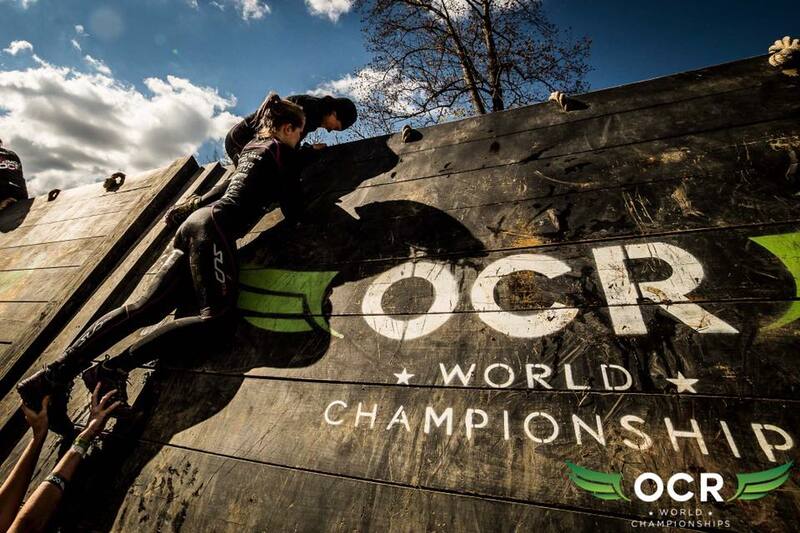 The OCR World Championships continues to grow as it enters its third year. 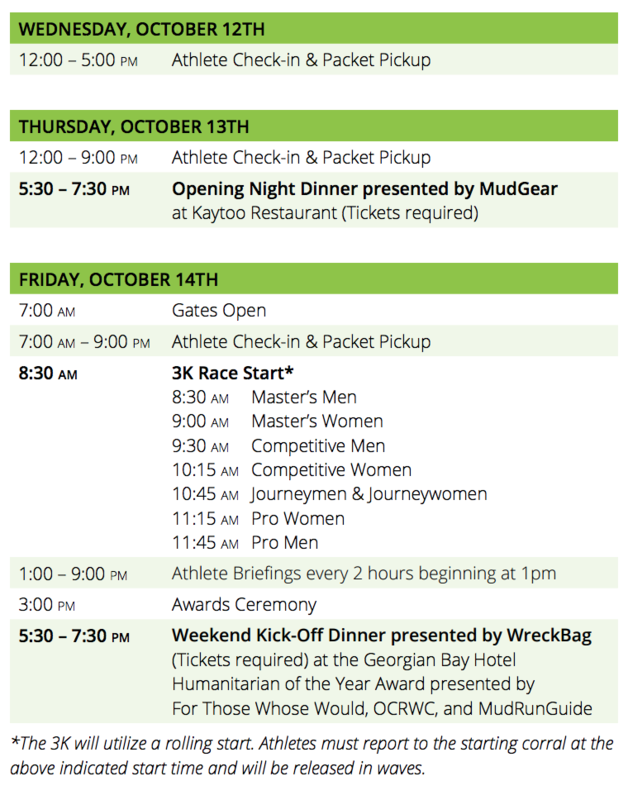 Mud Run Guide is on-site all week to bring you the coverage before, during, and after the weekend events. The action starts Wednesday with packet pickup from noon to 5:00pm for both the 3-kilometer short course and 15-kilometer World Championship races on Friday and Saturday. Registration is still open for the 3-kilometer race until Wednesday morning. Thursday packet pickup begins once again at noon through 9:00 pm for 3K and 15K athletes. Athletes are encouraged to pick up their packets early and avoid the last-minute rush. At 5:30 pm on Thursday, the main festivities begin with the Opening Night Dinner presented by MudGear at Kaytoo Restaurant. Tickets for the event are currently sold out. Friday the swings into high gear with the debut of the 3-Kilometer short course. The gates open at 7:00 am and last minute packet pick-up on of the 3K course begins at 7:00 am. Any athletes looking to do last minute pick-up are to be at registration at 7 am. The action kicks off at 8:30 am with the master's athletes on the short and fast 3-kilometer course. The pro athletes head out at 11:15 am and are not to be missed as several American Ninja Warrior Alumni will be flexing their obstacle skills on this unique course. The awards ceremony for the 3K Pro Heat will take place at 3:00 pm in the village. After the 3K race is complete, mandatory athlete briefing will begin at 1 pm and continue every two hours until 9pm. The Weekend Kick-Off dinner presented by WreckBag will take place at 5:30 pm where the For Those Who Would Humanitarian Award winner Allan Ajoy will be presented his award. Limited seating still available for the dinner at Georgian Bay Hotel. Saturday the main event kicks off 6:30 am when the festival opens, and the first wave goes out at 8:00 am with the Pro Men followed by the Pro Women at 8:20 am and heats continue to be released every 20 minutes for the rest of the day. Athletes can find their Bib Number here and there start time below. Currently, OCRWC is not allowing any last minute transfers of heats for Saturday's races. Throughout the day athletes registered for the Team Event will be able to pick up their race packets for Sunday morning. 5:00 pm all the awards for Saturday's races will be given out in the village followed by a party in the village with a live band to celebrate the athletes. 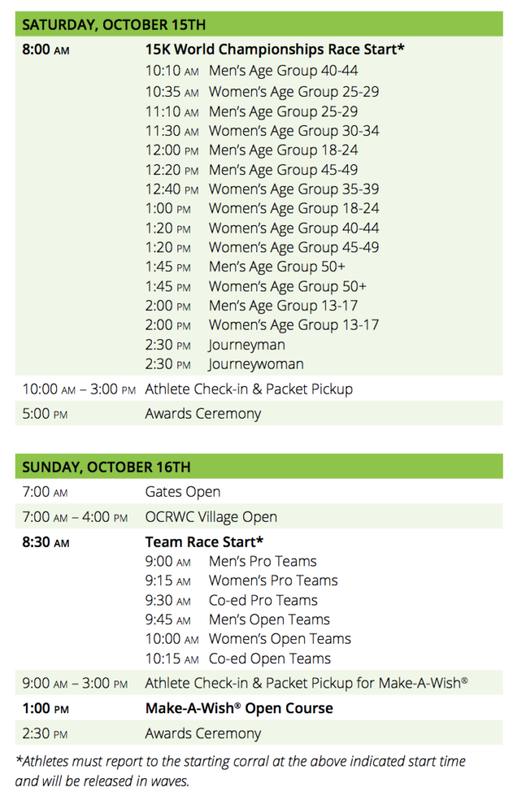 Sunday the gate opens at 7:00 am and the Team event kicks off at 8:30 am. The team race was a favorite of many athletes last year offering a fast and furious event showcasing the talents of athletes in specific skills. The Make-A-Wish heat goes off at 1:00 pm and is open to any and all who want a crack at the 15K World Championship course. This year is poised to be the biggest OCR World Championships yet. Watch for nightly live shows predicting and showcasing all the action at Blue Mountain on the OCR World Championship Facebook Page and replays on Mud Run Guide OCR World Championship Coverage Page. Watch for Mud Run Guide's predictions and continuing coverage all week long. Stay tuned to Mud Run Guide all week long for comprehensive coverage you can trust.